Indulge in some hi-tech fun with gaming at SkyZone, which boasts of new-age gaming gear and ultimate gaming experience. This indoor entertainment center is a perfect place to hang out with friends and also for your family. Opt for conventional favorites like air hockey and bumper cars, or get more adventurous with mini roller-coasters at the 9D theater or just take your hand at bolwing. Avoid the scorching heat, walk in to a gaming arcade and grab your consoles for a fun day out. What you see – SkyZone is the largest gaming arcade in North Karnataka and right on your first visit you know it’s true. 10,000 sq feet of space is ready for gaming for all ages from 6 to 60 years. Located on the 2nd floor, Kanakadasa Plaza, Opp.BIMS, Dr.Ambedkar road Belgaum. There is parking space for about 40 cars in the basement and also on street parking for Two wheelers. Games for Young Adults: Fast & Furious, Slam & Jam, Dance-Dance-Revolution, Super Bikes, Air hockey. 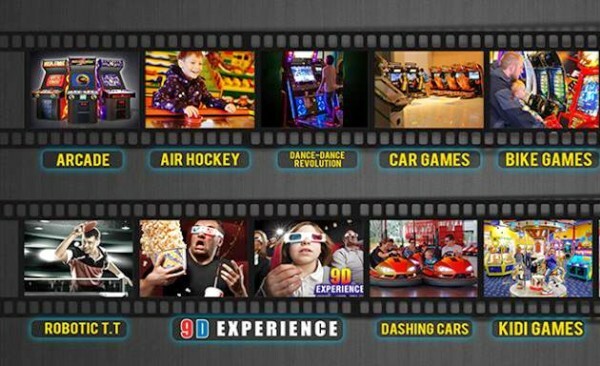 9d theater, 4 bowling lanes, Dashing car zone, Party hall, Food court 45 arcade games. Games for small children: mini train, carousel, Ducky splash, GoGo ball, Mind teasers. Sports Lounge, Pro-cricket lanes, Performance & Music related activities would be added shortly. In house catering would commence in sometime, currently the Wild sugar products will tingle your taste buds along with Aditya Ice-cream kiosk. What you get – Tons of entertainment for the entire family is guaranteed at SkyZone. 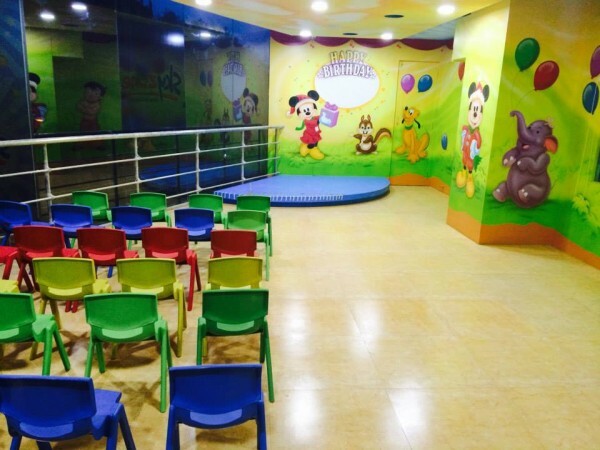 The Party zone for Kids is another awesome place for the kids to celebrate, eat and yes play games of-course and all this will come in a package to suit your budget and need. Security features have been taken care of so that the children dont get injured. The 9 D theater with a 8 seat capacity is an awesome experience with the roller-coasters rides, Horror rides and for the kids the Cartoons come alive with live bubbles,snowfall,water etc. About 110 different rides can be seen and experienced. The bowling allies would be operational in another weeks time. All payment to be made by purchasing an RIFD card which one can recharge with any amount and tap it at the gaming console and enjoy. The Card is valid for a year and even you can avail of the special offers which are floated on a timely basis. The same card can be used to buy the food and beverages. wats the cost of bowling, 9d theater, n other games? Really excited about the bowling alley. I am surprised nobody setup one till now. Hopefully they maintain it. Wishing them all the best.